Sometimes deadlines exist to be broken. In the run-up to this year’s Thought Bubble we set cut-off dates for review requests but left the door open to submissions for possible previews thereafter. 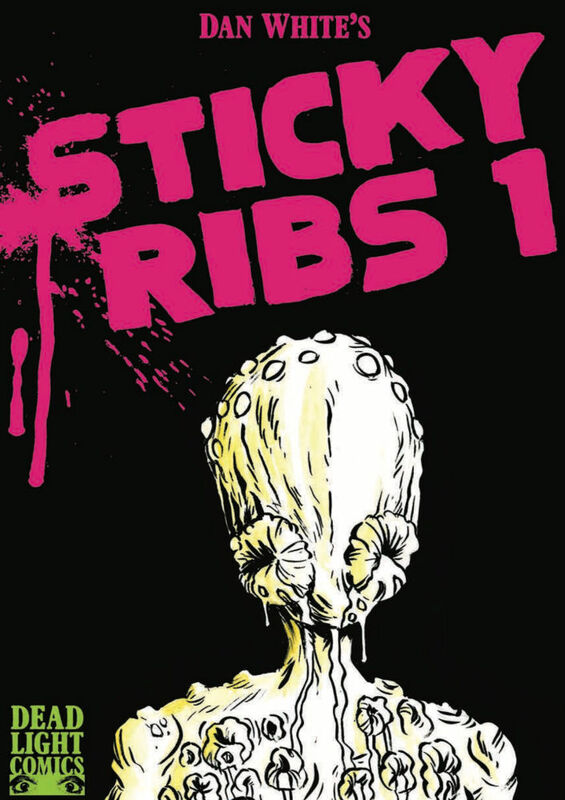 One of those books in the “previews” pile was Dan White’s Sticky Ribs #1, a new horror comics endeavour from the creator responsible for the Broken Frontier Award-nominated Cindy and Biscuit series. Sticky Ribs so embodies everything that makes White’s work so appealing – that morbid charm, that contrast of the pedestrian and the netherworldly, that juxtaposition of the blasé and the horrific – that we couldn’t simply preview it without at least some accompanying commentary. Sticky Ribs is an ongoing horror anthology which will feature two stories per issue, a ‘double feature’ if you like. Having flirted heavily with horror in my previous comics ‘Terminus’, ‘Insomnia’ and ‘Cindy & Biscuit’, this is my first proper horror comic and I’m hoping to bring a lifetime of influences and ideas as a horror fan to this new endeavour. ‘Sticky Ribs’ will go to all the strange and unsettling places I’ve wanted to go, and will be a place where Cronenbergian body-horror rubs up against the atmospherics of MR James, where the gloopy excesses of Stuart Gordon will nuzzle against the restrained derangement of Ramsey Campbell, all in the form of compact short stories. Sticky Ribs is the first comic to be published by my new imprint Deadlight Comics and I hope to be attracting work by some of my favourite comics peers, pals and heroes to also publish there. Describing itself as a horror double bill then, Sticky Ribs comprises two short comics tales ‘Your Body’ and ‘Jackie Goes to Hell’. In the first offering two schoolboys discover an otherworldly corpse in the woods and slowly become obsessed with this mutated cadaver to the point that it haunts their dreams. White’s cartooning here – with all its wide-eyed, child-like innocence rooting it firmly in the worldview of its protagonists – makes the events depicted all the more disquieting as he proves again his mastery of pacing and the measured reveal. 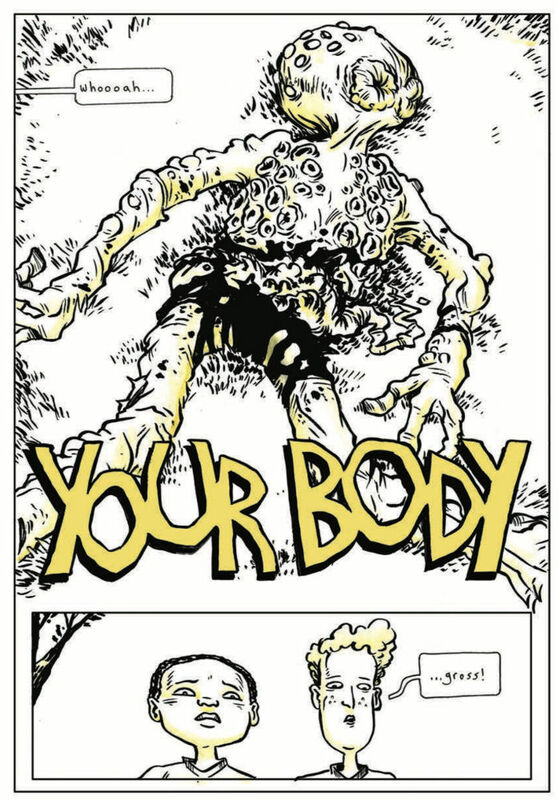 Whether the audience wants to read in greater possible metaphorical significance to ‘Your Body’ about impending adolescene or prefer to simply interpret this as a memorably disturbing piece of body horror is, of course, up to them. But what most sends a shiver up the spine in this opener is not so much the superficially unexplained nature of events as the implied cyclical nature of what we are witnessing. One of the great strengths of White’s work, and one that ensured that Cindy and Biscuit constantly felt fresh and innovative, is his continual experimenting and toying with the structure of the graphic narrative. 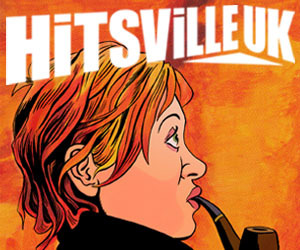 In the second story ‘Jackie Goes to Hell’ we join the titular character as she takes a day trip to the underworld to look for her missing partner Martin. Here he presents something that sits between illustrated story and comics, descibing Jackie’s ongoing journey below each panel. 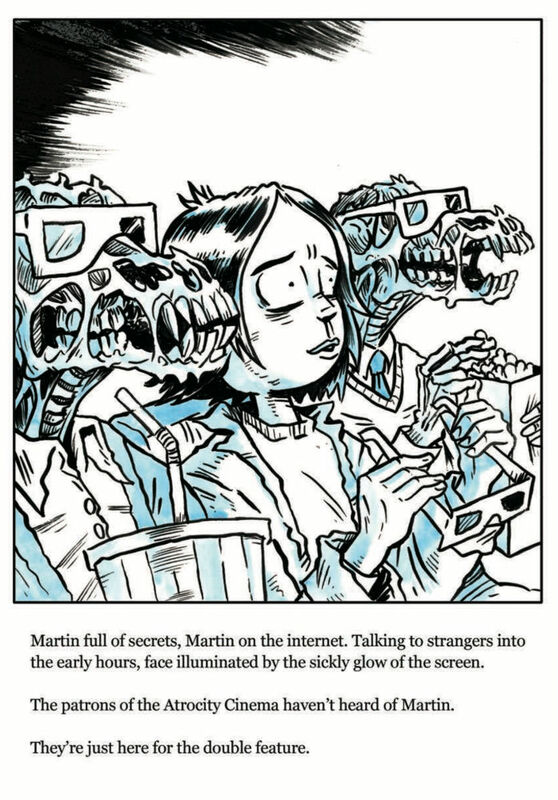 I was reminded of White’s creepy one-panel Terminus cartoons here. They have the same sense of being discrete entities in themselves; each feels like it could be a springboard for a spin-off story in itself. But they’re threaded together in such a way that it feels like Jackie is briefly wandering through the separate narratives of an entire cast of hellish denizens as she passes through locations including the Atrocity Cinema, the Shame Spiral and the Eternal Dinner Party. It takes her towards an ending that, in its quiet abruptness, is possibly the darkest thing in the whole comic. Finishing up with a very personal and intriguingly revealing account in essay form of his first encounter with the film An American Werewolf in London, Sticky Ribs is a perfect showcase for Dan White’s chillingly, but rather enticingly, warped imagination. You only have to look at the pull quotes on a White book to know that his work has not gone unrecognised on a critical level. But, as I seem to say every single year around this time, it remains a huge frustration that the acclaim he deserves is not far, far wider. This one needs to be on your must-buy list at Thought Bubble this coming weekend. For more on Dan White’s work visit his site here and follow him on Twitter here. You can visit his online store here. You can find him at The Mindless Ones table 80 in the Originals Marquee at Thought Bubble.